Once upon a time, many years ago (in 1979), in a faraway land (North Carolina), a boy was born. He grew up to be a stellar athlete. He was good at math, fixing things, and making money. In the distant land of New Mexico, a girl was born in 198ug3287twdhbdx. She was a dancer. She had some sort of strange math learning disability, probably due to her mother dropping her on her head was not good at math. But she was very good at spending money. She also liked to read a lot. The fathers of the two children met at work in Virginia, and soon the families were fast friends. The girl knew at once that the boy was the most handsome boy she had ever seen in all of her 5 years. The boy was more interested in building forts and torturing his younger siblings. Many years passed, and the girl got pretty hot (if I do say so myself). One day, the boy dropped by to mow the lawn for the girl's mother. He noticed that the girl had pretty nice legs and asked her out. To her delight, they got married almost two years later. That was 8 years ago yesterday. Since we were married 8 years ago, we finished our last year of college, bought a house, did some major work on said house, adopted a dog, travelled, had two kids, and argued. But at least we didn't have the Seven Year Itch! I would have posted about our anniversary yesterday, but we got all caught up in the celebration. Not really. T had to work, and we spent all our money on building the deck two weeks ago. 8 years ago, I'd be wanting to know where the heck is my bling? But I did buy him a donut this morning, and then he got me a bread maker. I'm a happy camper! Happy anniversary, and thanks for sharing your story! What a fun "how'd you meet" story! Happy Anniversary to you both :)!! What a sweet story. Happy Anniversary!!!! awe :) Happy Anniversary my friend!! Hope you had a Happy Anniversary! 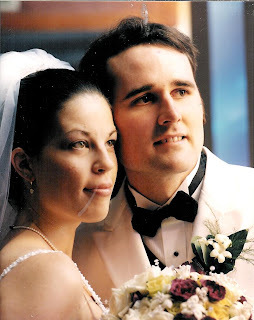 Happy Anniversary, Amanda! Congratulations on 8 years together! Happy Anniversary!!! What a cute love story and I think the bride is still very HOT!!!! Your wedding picture was beautiful! I'm anxious to hear about all the yummy bread recipes you'll be making for the family. Happy Anniversary! I love your love story! You are such a gorgeous couple! Happy Anniversary! You've got a few months on us as our 8th is this October. Your wedding picture is beautiful!